This award is presented to the coach driver who has best demonstrated excellent performance from the customer perspective in the 12 month period to the end of December 2010. 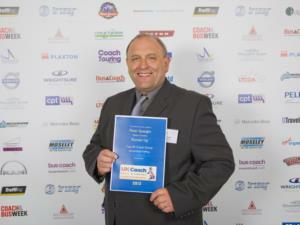 To win the title of Top UK Coach Driver, nominees need to go that extra mile to provide the customer's ideal: a driver who is friendly, helpful, conscientious and mindful of passengers' comfort and well-being - in short, a true professional and worthy ambassador for the job. Peter Speaight is considered to be reliable, flexible and versatile, taking on any task that is put his way. He has an excellent record and his employers said; "Peter is a rare employee who can be treated as part of the management team. The number of requests for his services are many and varied." The judges agreed that Peter is well worthy of recognition. Coach Services Manager John Fowler was delighted with Peter's success "Peter has always been at the top of his profession and this proves he is amongst the top coach drivers in the UK, our clients can be confident when they travel with Peter that they are travelling with the very best"